Simple and hearty, this chunky soup is easy to make and has a nostalgic element of home-goodness. It is warm and filling, the potatoes give texture and thickness, while the creamed corn lends a light touch of sweetness. It is a perfectly quick meal for rounding out a busy day. 1. 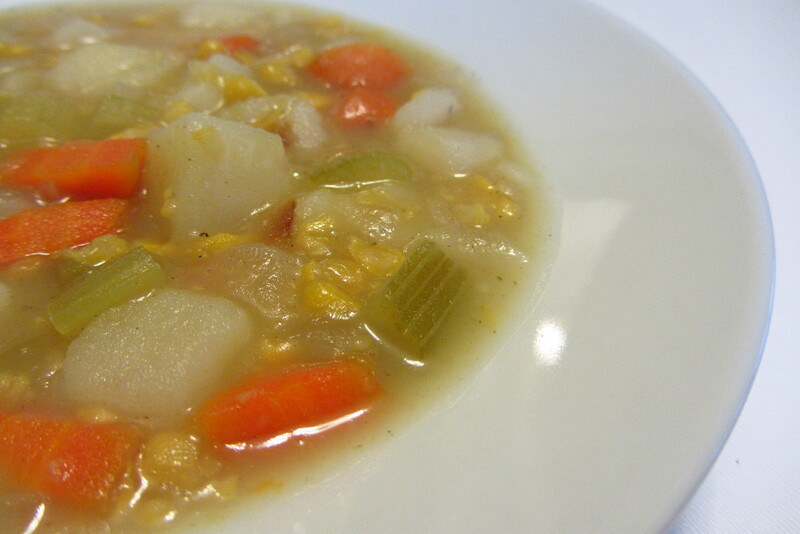 In a medium pot, bring to a boil the vegetable broth, potatoes, celery, carrots, bay leaf, and thyme. 2. In a skillet, saute the onions in the olive oil until translucent, then add to the soup. 3. Reduce heat and simmer the soup until the vegetables are tender, about 10 minutes. Season soup with salt and pepper as needed. 4. Stir in the creamed corn and tabasco sauce, simmer a few minutes more to heat through before serving. * I like to use an Idaho or Russet potato for this recipe. They break down and will thicken the soup as it simmers. * The tabasco sauce is optional, but it balances well with the sweetness of the corn, and it delivers a nice little kick too. * Don’t have broth? Water works just as well.